Fuller more luscious lips are a sign of youthfulness. As we age, our bodies do not produce as much hyaluronic acid and so the volume in our lips and around our mouth becomes depleted and wrinkled. Lip augmentation creates fuller, plumper lips and reduces fine wrinkles around the mouth. 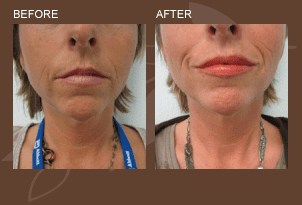 Injectable hyaluronic acid fillers such as Juvederm and Restylane are used for this procedure. Each patient is different in how many syringes will be needed for full correction. Usually 1-2 syringes will be used to provide the desired result. A dental block is performed to block the nerves to the lip area. All medications that contain ibuprofen should be stopped 7 days prior to injection date. Mild swelling and/or bruising is expected and lasts 5-7 days. Hyaluronic injectable fillers last up to 1 year depending on each person’s metabolic rate. Many people consider full cheeks very attractive. Weak cheeks can create an aged appearance to the under-eye area and cause a decent of the malar fat pad. If you have lost volume in the malar region associated with aging or if you desire a fuller, more youthful appearance, you may be a candidate for such fillers as such as Radiesse, Juvederm or Restylane/Perlane, which is also used in our Liquid Facelift procedure. Autologous fat transfers may also be used to provide volume. During your free consultation, syringe amount for full correction will be determined and full pricing discussed. Juvederm, Perlane or Restylane – 600.00 per syringe; when 3 or more are used in same session, the price drops to 500.00 per syringe. Please ask about special pricing for our “Liquid Facelift”. Additional savings on 4 or more purchased syringes.